Pyotr (Peter) Ilyich Tchaikovsky MUSICAL Bear. Composer Series German Mohair teddy bear with musical movement that plays music from The Nutcracker Suite Ballet, Op.71a. The Russian composer Peter Tchaikovsky studied at the Petersburg Conservatory from 1862-66. He is known as the founder of the Russian ballet tradition. One of his most famous pieces is The Nutcracker which premiered in St. Petersburg in 1892. Since then The Nutcracker has become one of the most popular Christmas classics in the theater world. In the story Clara receives a nutcracker from Herr Drosselmeyer on Christmas Eve. In her fantasy Clara travels with the nutcracker in to a world full of fairies and toy figurines. Hermann Spielwaren create beautiful Mohair teddy bears in Coburg, Germany in the traditional style. 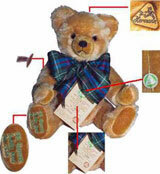 They have produced teddy bears for the world for three generations. What started with just a handful of teddy bears has grown into an amazing variety of unique bears each with their own personality. Costumed in his Russian outfit, Pyotr Ilyich Tchaikovsky comes with his own miniature nutcracker from the Ore Mountain. MUSICAL HERMANN-Spielwaren GmbH 19234-1 A delightful, fully jointed Mohair Teddy Bear, which is traditionally stuffed with excelsior.